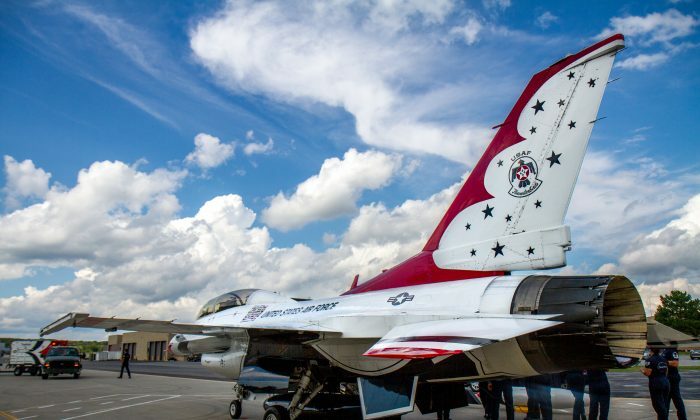 NEW WINDSOR—The New York Air Show rolled out the red carpet for the U.S. Air Force Demonstration Squadron the “Thunderbirds” this year, even changing the date of the air show so they could attend. The show was originally scheduled for the last weekend in August, but was moved to Sept. 3-4 early last December to accommodate them. The six F-16 Fighting Falcons, based at the Nellis Air Force Base in Nevada, are famous for their tight formations and group and solo maneuvers, a treat not seen at last year’s show. Reporters and photographers at Stewart Air National Guard Base were told upon arrival to media day on Sept. 1 to secure anything that could be snagged in a high wind so that it wouldn’t get caught in the planes’ engines. Crews could be seen meticulously vacuuming the pavement with a metal vacuum attached to a truck right before the Thunderbirds’ arrival. “We are constantly checking the pavement for cracks, for foreign object debris (FOB), or foreign object damage because it is a constant issue with jet engines. Its more prevalent with fighters because of how low their engines are,” Tech. Sgt. Pat Rougeaux explained. The red, white, and blue pattern of the planes is as striking as the 65-person entourage that comes with them—eight pilots, four support staff, and dozens of maintenance crew. The Thunderbirds require an entire C-17 Globemaster III to transport all the support staff. It’s a six-day-a-week job during their 9-month travel season, which means almost 200 days a year on the road, said Executive Officer Capt. Angelina Urbina. They are scheduled to attend 39 shows this year, which translates into 72 performances during their March to November air show season, she said. When they’re not flying in shows, the pilots, who were all trained for and have flown in combat, fly at least twice a day for training. Besides their performances, the Thunderbirds do public relations for the Air Force, speaking at schools, visiting local hospitals, and talking to community groups wherever they go. “Our mission is to represent over 660,000 airmen that are working hard every day in the Air Force,” Urbina said. They were scheduled to visit St. Luke’s Cornwall Hospital in Newburgh on Sept. 2.